Ideal for families, groups of friends and corporate retreats. Chateau / Country House5000 sq. ft. The Little Barn is 86 square metres on two floors with three twin bedrooms and shower rooms, basin and loo. Terracotta tiled floors large covered terrace of 100 square metres with BBQ, sofa, dining table, ping pong and open views of the gardens and park . The Chapel is 28 square metres and is a twin studio with shower room, basin and loo . All weather, passive solar heated (28-30 degrees C) covered swimming pool from April to October. Secluded garden and parking, 100 square metres of additional covered terrace . Table tennis, volleyball, access to 8 acres of land. Linen, towels (beach and swimming pool towels not provided) weekly cleaning of bedrooms included. Cleaner available. All are large beds, 3 doubles and 14 singles with hypoallergenic latex mattresses. Situated in a small rural hamlet 3km from the charming town of St Saens and the largest beech forest in Europe. 1 hour 45 from Calais, 1 hour Le Havre, 40 minutes Dieppe and clean unspoilt beaches. The designs for the houses evolved as we went, as family holiday homes with an emphasis on maximum efficiency for the tasks of living and most emphasis on relaxation and enjoyment. The one area we made no compromise on was space in the houses, the terraces and the green space around (8.5 acres). We built the biggest pool we could find and invented a passive solar heating method for it that makes it a unique and very pleasant environment to be in. We hope we have succeeded in offsetting our own and our guests carbon footprint by constant planting and careful use of resources. By limiting the amount of accommodation we offer we hope to have reached a happy compromise between tourism and nature where both benefit, we have the privilege of living and working here while being able to share it. In addition to the houses the area offers many activities . There are two tree adventure parks within half an hours drive , the 18 hole golf course five minutes away , reservoir fishing ten minutes away , horse riding for the initiated or not and many historical buildings and landmarks , innovative gardens and the forest D'Eawy among others . Yes - beds are made before your arrival. Yes. Plenty of space to dry outside as well. Yes. Free wifi access in both houses. Towels provided for bath and shower rooms but no pool or beach towels. 2 in big house, 5 sofas, 4 armchairs. The large sitting room has 4 sofas and 2 armchairs. 1 in small house 2 sofas, 2 armchairs. Yes extra capacity, both houses. Yes both houses, both family sized. Chapel small fridge. Yes large five ring stove top, both houses. Yes both houses, extra large. Yes both houses and Chapel. Fully equipped in both houses. We provide foil, clingfilm, soap, washing up liquid, dishwasher tablets, dish washing brushes and sponges. Large dining room table seats 20/22. Various board games, jenga, boule, chess etc. Lego, train set (wooden), small slide/climbing frame etc. Yes small house has very large veranda terrace. Over 200 square metres of available terrace areas , half of which is covered . Reputed 18 hole course at St-Saens and driving range. The club house is a classic Normandy Chateau with bar and reasonably priced restaurant, membership not required. We were courteously met by the owner Kate Blacker on our arrival and given a conducted tour of the property and grounds. All bedrooms were en suite, comfortable - bed linen and towels provided - and met the needs of our extended family. The modern kitchen in both the large and small house was well equipped. Large dining room and comfortable lounges. We were fortunate with the weather and all meals were taken on the large patio area outside the large house - bbq facilities provided. The grounds of the property were well maintained with flower beds and large areas for the children and adults to enjoy games of rounders and cricket. A highlight of the property was the heated outdoor enclosed swimming pool. Locally there were interesting villages and manor houses and forests to visit. The property is within easy reach of the channel tunnel and ferries. An exceptional location for a family holiday and thoroughly recommended. Les Ecuries is a beautiful property which was accurately described in the listing. However, it was much larger than we were expecting, and so thoughtfully done out that you had everything you could need, including well-equipped kitchen, ample storage, blackout blinds and gorgeous fluffy duvets! We found the layout of the main building particularly ideal for our 3 families as all parents were able to stay in a room close to their children. Two of our party then stayed in the Barn - a spacious annexe about 50 yards away which provided an ideal retreat for them as they didn't have children with them!! It is worth looking at the aerial photo and noting that the swimming pool is a little way from the main house and is covered - this made it perfect for our group (8 adults and 6 young children) as it was warm and secure. The property is very well-maintained, clean and comfortable. Kate, the property manager was incredibly quick to respond to all my queries and on hand at the property if needed, whilst also being totally non-intrusive. I would definitely recommend this property to a friend, either looking for somewhere to go with a group of families, or a large group of adults. The property is totally geared up for large groups, whilst still feeling characterful and indulgent. The location was rural and very peaceful. It's an easy 1.75 hour drive from Calais and half an hour from the coast and also Rouen. The nearby town of Sans Saens is charming and has a Carrefour and a playground. We went for walks in the nearby forests and had a delicious and very reasonably priced meal in Relais Hubert in nearby San Ventes. The place is calm and peacefull, surrounded by nature. All rooms are very confortable with a bathrroom for each. The owner has been welcoming. We spend with 20 friends, a great week-end. The only "false-note" is that the fridge were off when we arrived and it took the entire evening to get cold enough. Aside that, everything was perfect. Large group of us stayed at the property which was ideal for our needs, very clean and tidy and the owners could not do enough to make our stay a great one. I recommend the property that is well stocked in the kitchen and the dinning room was large enough to take us all. Definitely be back next year. Thanks. It was a great pleasure having you all . We have had many vehicle clubs here over the years as there is plenty of space to park and it was a magnificent sight seeing yours all lined up, a 'mod' splash of colour ! We are looking forward to another visit sometime and seeing you all again, thank you ! - Accommodation is spacious, with lots of history but beautifully restored and with modern fittings (all rooms en-suite), with very well-kept gardens. - The owners are very helpful, they are English but have lived here for over 20 years so know the area very well. They live on-site so are available if needed but discreet otherwise. - The pool is a real bonus, plenty warm enough in mid-Summer and a great size (12m long) for everyone to splash around in or to get some good exercise. 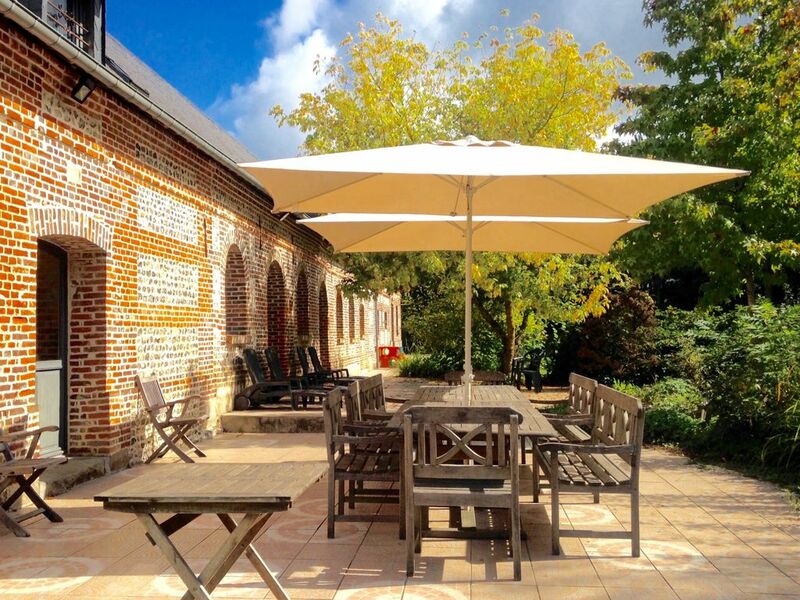 - The location is ideal: very well-connected (1h45 to Calais, close to local shops and autoroute) but also feels completely secluded with amazing view of stars at night. - Really recommend: Clere village and stately home, Aubin-sur-Mer beach, many lovely local markets. Would strongly recommend this to others. Sometimes you just know there has been a perfect match between guests and place ! The properties are well maintained and very well equipped. The grounds are extensive with several mowed areas suitable for sports such as rounders, volleyball, badminton and boules. The gardens are far more mature than the photos show and are interesting to walk around. The pool is a wonderful asset and was used a great deal during our stay. The main house is very spacious and came with enough chairs for everyone, even those staying at The Barn, which is a few meters away from the the main house. Both houses were clean on arrival. We really enjoyed our stay - with the weather being the icing on the cake. Would not hesitate to stay here again. The coastline from Dieppe towards Le Havre is an unspoilt stretch of small villages and beaches, some sandy and some pebbled, forty minutes drive away. Honfleur and Deauville are an hour and 20 minutes away. The hamlet of Mesnil Benard is a small farming community in picturesque countryside 3 kms from the town of St Saens on the periphery of the largest beech forest in Europe. 40 minutes from the coast made famous by the painter Monet and 25 minutes from the old medieval city of Rouen in the Seine Maritime region of Normandy. The forest D'Eauwy (dayvee) is Europe's largest natural beech forest with a network of cycle paths and riding tracks throughout. It is home to many easily spotted species of woodland animals, flora and fauna. There is a recently discovered WW2, V1 rocket site complete with (diffused) rocket on its launching pad. There are too many activities in the area to mention, but golf, riding, cycling, walking, carp fishing, tree adventure parks and body\kite\ wind surfing are just a few. The city of Rouen with its medieval quarter of small antique and fashion boutiques, restaurants, beautiful churches and Cathedral is a twenty minute drive away. The area is famous for it's many chateaux, historical houses and gardens which you could spend a week visiting there are so many, we can suggest a few prime spots if you are interested. We advise cyclists to bring their own bikes though hiring is possible from the Mairie at Auffay . This includes the price for the chapel studio for 2 . There are two rooms in the main house for 12 that have extra single beds making the maximum total of 22 beds . Booking Notes: 500 pounds/euros as a deposit on the booking which doubles as a damage caution or deposit returnable after the booking. Full payment is required six weeks prior to the booking. Changeover Day: Les Ecuries: Saturday during peak periods otherwise flexible. The Second to End Barn: Saturday at peak times otherwise flexible. The little chapel: flexible. Notes on prices: Our high season rates work out at about 40 euros per person per night.Short stays are 50 euros per person per night for groups of 10 and over. Security deposit is 500 euros for the two houses . We ask you for this as a down payment which doubles as the security deposit returnable after your stay leaving the full rental to pay six weeks before arrival.The price of the Chapel is not included (add 400 euros to displayed price) Tax de sejour is not included , it is 40 centimes per night per adult.